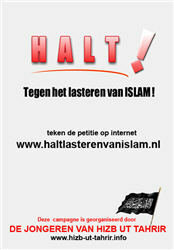 The Dutch Hizb ut-Tahrir youth have come out with a new campaign, against the slander of Islam. The campaign is carried out by passing out pamphlets, which are available online in English, Dutch, Arabic and Turkish, titled “Defending the holy Koran is an Islamic obligation”. The pamphlets are apparently directed at Dutch politician Geert Wilders, who is expected to come out in January with a movie about the Koran. Defending the holy Quran is an Islamic Obligation. Some people in Holland backed by others decided to produce a film about the Noble Quran, this film may be will be broadcasted in the Dutch TV in January next year. Those who are responsible for this shame work had declared that the objective behind their work is to show the fascism aspect of the Quran, and how the Quran motivates the hatred and violence. This film is just a part of an organized campaign leaded by some against Islam and Moslims in this country, its objective is to exercise pressure upon the Moslims so that they will leave their religion, their style is distortion, fabrication and mockery of everything the Moslims believe in. We, the Shabab of Hizb ut Tahrir in Holland, don’t expect that those people and those who are behind them will respond to the call of wisdom, and stop their work which contradicts the values of their ideology they used to speak a lot about, and cause the humiliation to a big number of the civilians of this country, but our hope is that the Moslims will move individuals and groups to honor the symbols of Allah and to defend their religion. And it has already been revealed to you in the book( this Quran) that when you hear the Verses of allah being denied and mocked at, then sit not with them, until they engage in a talk other than that( but if you stayed with them) certainly in that case you would be like them. Surely, allah will collect the hypocrites and disbelievers all together in Hell. (TMQ:An Nisa’ 140). This means that we should not keep silence regarding the mockery of our religion and the mockery of the holy Quran, it is a duty upon us to support our religion and to defend the Quran, and here we are the Shabab of Hizb ut Tahrir in Holland, we had started a campaign to defend the Quran and to forbad those who are trying to humiliate our moqudasat, and to stop the campaigns which will distort the image of Islam in this country, that is why we ask you to stand with us and to support us in our campaign, and to let our voices be heard to stop the continuous humiliations against us and against our religion. Keeping silence in such a case where your Quran is being humiliated may be understood by some people as a sign of acceptance so they will continue in their falsehood, others would understand your silence as a sign of weakness, so their hatred and their mockery of your religion will increase. But we know that you will not accept your religion to be humiliated, and you are strong in faith, that is why we ask you to deny this munkar by using all lawful means and not to be silent. O Moslims who are honored by Islam, listen to us and work with us to defend the Quran so that you will get the gayr of this dunya and the hereafter. During the past years, Holland has been dominated by a climate of slander and common insult towards Islam and Muslims. It is also evident that certain politicians and influential people are behind the current hostility. In answer to this we, the shabab of Hizb ut Tahrir in Holland, have initiated the campaign “Stop the slandering of Islam”. With the help of this campaign, which entails a substantial signature petition, we want to give the Muslims a voice. This will enable them to react in a respectful and proper manner to the constant slandering of high values within Islam and the feelings of insult and anxiety that are the result of this. At the same time, the campaign “Stop the slandering of Islam” also makes clear that the common insult of Islam and Muslims creates an altercation in the Dutch society and hereby seriously disturbs the harmony of the Dutch society. We can report that the first weekend of this campaign has lead to positive reactions from the community. The initiative has been welcomed and we have received messages of support from both Muslims as non-Muslims.